Retold from the Rudyard Kipling original. 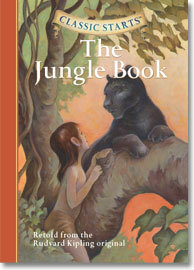 One of the most beloved classics in children’s literature, Kipling’s masterpiece follows Mowgli, the boy raised by wolves, and his animal friends as they fight for survival in the Indian jungle. Young readers will love the wise bear Baloo and Bagheera the black panther; shiver at the vicious tiger Shere Khan; laugh at the silly monkeys; and feel compassion for the grown-up Mowgli—who must finally acknowledge his own humanity.